Forget about pastels and delicate colours as manicure for summer 2016, surprisingly, offers us intense colours, brocade and geometric shapes. Check what’s on this season. Brocade for every day ? Gllitering nails won’t be popular only for a date or night- out. You can wear such manicure to your work and school. Metallic grey, blue navy and red colours want to accompany you all day long. For those bravier, wearing a typical metallic nail varnish will be a perfect option. Choose the brands which will stay on your nails and will last longer than 24 hours. No more chipped off nails – a good nail polish should stay on your nails for several days. Dark eveywhere… and what then ? Summer 2016 manicure can really surprise you. Dark, intense and juicy colours are becoming more and more trendy. The more intense and bravier, the better. Multicolor nails are extremely trendy. The lattest Vivienne Westwood’s fashion show can be and inspiration for you. Madness of colours will positively suprise you. But what if you want to have a pink manicure? If you are a fan of pink, beige or white manicure, we have good news for you – you can wear them all with dark colours which are extremely on this season. White and colours similar to it when combined with black will bring about excellent effects on your nails. Contrasts are on so you can easily use light colours and patterns on dark nails or make a french manicure in all the colours trendy in this season. Geometric patterns on all or some chosen by you nails? This season it’s the best option! 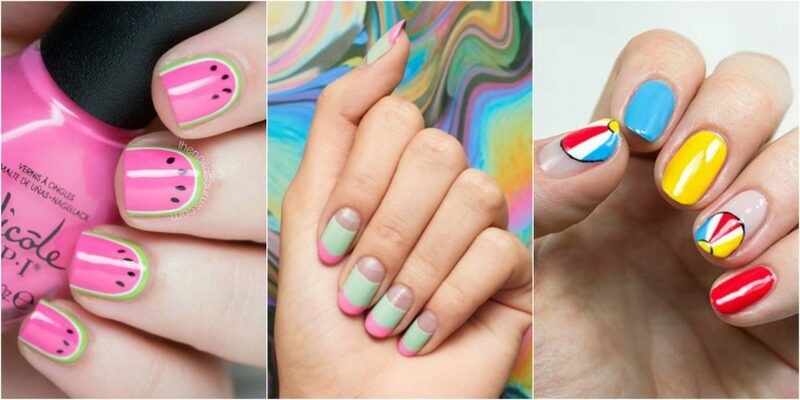 Straight lines and stripes on your fingernails or only on its fragments as well as squares, circles, triangles or some more original shapes will all make your nails look very interesting. You will be in the spotlight everywhere you go. What’s interesting is that a combinaton of colours and textures (brocade with matte, burgundy and navy blue, navy blue and black and yellow preferably in matte versions as well as light colours and silver). Does the shape really matter? Yes it does! Short nails are becoming more popular nowadays. There is nothing more disgusting then the sand under too long nails. Summer manicure 2016 is supposed to be short but carefully filed in a half-circle or delicate pointy shape. Square fingernails are off now, but if you miss it you still can have a manicure with square patters. It’s obvious that men pay attetion to female nails. They are attracted by them like a magnet. If you want your man couldn’t take his eyes out of you, run to the shops to buy dark red ,navy blue, black and white varnishes . And do not forget about a good topcoat varnish which will give a high gloss to your manicure.